Seeking a personal retreat in Portland, Oregon area? The Movement Center is the perfect place for refuge, reflection, and internal reorganization. We offer customized programs which include meditation, spiritual practice, hatha yoga and more. Visit our website today to learn more. Are you looking for a deeper journey, relief from stressful life demands, or for help in making a significant transition in your life? Or maybe you simply feel that there's something more to life? 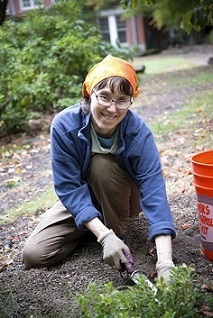 Our Northeast Portland retreat center can be your place for refuge, reflection, and internal reorganization--and time dedicated to building connections that will support your further growth. We regularly welcome guests from our local Oregon community, from places all over the United States, and from all around the world. Even if you feel drawn to be here for no apparent reason, honor the impulse. It could be one of the most important things you ever do. Any number of our guests have found that to be the case. A retreat at The Movement Center offers an unparalleled opportunity to build a foundation for meditation, spiritual practice, and hatha yoga that you can maintain long after you’ve returned to the busy-ness of the outside world. Remove yourself from ordinary distractions and reconnect within. from one of our recent guests…. My time of retreat at The Movement Center was one of letting go, opening, and being filled. From the moment I arrived, I was welcomed warmly by everyone I met and was immediately invited into the community through meals, meditation, yoga classes, and service. I have never experienced a spiritual community like this. I am in awe of the grounding you have gained through the discipline of daily meditation practice. You live consciously together with love and respect and an honoring of life and each other. I feel your connection to God. Your openness and love and warmth flowed right to me. I feel I’ve been at the fountain. I feel loved, honored, and filled. Thank you. 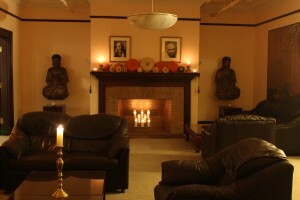 Retreats are scheduled around meditations, hatha yoga, and self-guided study. You’ll have unstructured time to take walks, rest, journal, read, and simply “be.” Private instruction in hatha yoga or the Vajrayana healing practices is available for a reasonable fee. Attend evening meditation | Relax over dinner and get to know others. We practice the traditional yoga practice of creating flow with one's environment by giving back. Helping out with seva every day is customary. It’s also a good way to learn new skills and make connections with the ashram community. The Movement Center is located in a historic building on three acres of lovely lawns and gardens, close to downtown Portland and easily accessible via public transportation. Our facility includes a magnificent meditation hall; warm and light-filled hatha yoga studios; simple and comfortable guest rooms; gracious common living areas; and an abundance of sacred art throughout. Click on the blue button below to learn about our rooms, rates, and guest guidelines. 2. Click on the button below to fill out your Personal Retreat application. Please give us at least 5 days notice in advance of the time you would like to visit.